The St. Louis Cardinals went 2-5-1 in spring training action last week as Dakota Hudson seems to be leading in the fifth starter race. In our weekly history feature, the Hall of Famer Cy Young, the namesake of the famous pitching award and a former Cardinals pitcher, is remembered. The Cardinals edged the Nationals at the Ballpark of the Palm Beaches on Monday. Jack Flaherty and Max Scherzer were the starters. Flaherty went five innings and gave up one run on three hits while fanning five and walking one. Andrew Miller, John Brebbia, and Jake Woodford followed. Brebbia surrendered a run in the seventh, while Miller pitched a scoreless sixth and Woodford ended with two scoreless innings. The Redbirds offense got on the board in the third inning on a Dexter Fowler RBI single that scored Harrison Bader, followed by a Paul Goldschmidt double that plated Matt Carpenter and Fowler. Fowler was 2-for-3 with an RBI and a run scored. He also had an outfield assist, throwing Adam Eaton out at home plate. The Cardinals were blanked by the Braves on Tuesday in road game at Lake Buena Vista. St. Louis hitters scattered six hits, with Yadier Molina going 2-for-3. Yairo Munoz, Drew Robinson, and Rangel Ravelo each doubled. Miles Mikolas got the start, and it was a rough outing for the right hander. He pitched five innings and gave up five runs on eight hits, including two home runs. Tommy Layne, Mike Hauschild, Alex Reyes, and John Gant combined for the final four scoreless innings. Robinson committed a fielding error, his second miscue of the spring. The Redbirds offense was flat in Wednesday’s 4-1 loss to the Marlins in Jupiter. The single St. Louis run scored on a ground ball single to right field by Max Schrock. The only other hits came from Marcell Ozuna, who was 2-for-3 with a double. Starter Dakota Hudson hurled three innings, giving up one run on two hits. The righty fanned three and walked three. Jordan Hicks and Andrew Miller each pitched a scoreless inning. Chasen Shreve gave up a run in the sixth. Tyler Webb tossed a scoreless seventh, followed by Mike Hauschild, who surrendered two runs in the eighth. Paul DeJong stole his second base of the spring. Schrock committed a fielding error. The Cardinals and the Mets played to a 1-1 tie in Jupiter on Thursday. Harrison Bader had a big day, going 2-for-3 and stealing three bases. No Cardinal had stolen three bases in the last 25 years prior. Yairo Munoz doubled and Jose Martinez tripled. The lone Redbirds run scored on Munoz’ double in the seventh inning. Starter Michael Wacha pitched five scoreless innings. The right hander allowed five hits, struck out two and walked two. Dominic Leone added a scoreless sixth. Mike Mayers gave up the lone Mets run in his two innings pitched. John Brebbia tossed a scoreless ninth. In one of two split squad contests Friday evening, the Cardinals were routed by the Astros at home in Jupiter. It was an Adam Wainwright start. Wainwright pitched 5 1/3 innings, giving up two runs on three hits. The veteran righty struck out five and walked one. Andrew Miller followed in the sixth but couldn’t record an out. He surrendered four runs before being taken out for Ryan Meisinger. Meisinger got the final two outs but relinquished a run of his own. Jordan Hicks gave up a run in the seventh, and Alex Reyes yielded three more runs over the last two innings. St. Louis’ offense put up two runs on six hits. Paul DeJong hit a solo home run in the second to put the Cardinals on the board. In that same inning, Randy Arozarena singled in a run. Those were the only Cardinals runs. Dexter Fowler stole his first base of the spring. Catcher Joe Hudson had a passed ball. The second split squad game was played at the Ballpark of the Palm Beaches and the Cardinals were blanked 5-0. The game was highlighted by Astros manager A.J. Hinch being ejected in the first inning by home plate umpire Angel Hernandez. The Redbirds scattered five hits but could not get a run home. Tyler O’Neill had the only extra base hit, a double. Daniel Ponce de Leon pitched four innings and gave up three runs on four hits. The right hander fanned four and walked three. Chris Beck followed with a scoreless fifth. Chasen Shreve surrendered a run in his two innings pitched, before Tyler Webb gave up the final Astros run in the eighth. Drew Robinson stole second and third base for his first two stolen bases of the spring. Marcell Ozuna stole his first spring base. Rangel Ravelo made a throwing error. The Cardinals took on the Nationals again at the Ballpark of the Palm Beaches on Saturday. The offense finally scored substantial runs, but seven of the eight runs came in the final three innings when all of the starting regulars were done for the day. The first run was drive in by Jose Martinez in the first inning. In the seventh inning, the Cardinals 2018 first round draft pick, 18 year old Nolan Gorman, hit a solo blast to the walkway behind the right center field bleachers off Nationals reliever Kyle Barraclough. Randy Arozarena immediately followed with a solo home run to left field. In the ninth inning, with Nationals closer Sean Doolittle on the mound, Tommy Edman doubled to score a run, and Max Schrock followed with an RBI single. Then Andrew Knizner hit a screamer to left field to plate three runs. The kids had a day and pulled victory from the jaws of defeat. The game began with Austin Gomber on the mound. It ended for Gomber after four innings in which five runs on eight hits crossed the plate. Tommy Layne and Mike Mayers combined for a scoreless fifth. John Brebbia, Dominic Leone, Hunter Cervenka and Jake Woodford followed with a scoreless inning each. Gorman’s day was slightly marred by two fielding errors. Another day of weak offense led to a 4-2 loss to the Marlins in Jupiter on Sunday. Until the ninth inning, the Cardinals were no-hit by Marlins pitching, beginning with a six-inning scoreless, hitless outing by starter Trevor Richards. The offense finally broke through when Dexter Fowler hit a leadoff single in the ninth, and Paul Goldschmidt followed with a single that brought Fowler home on a throwing error. Goldschmidt ended up on third and was driven home by a ground out from Andrew Knizner. John Gant got the start and pitched four innings, giving up one run on four hits. Ryan Meisinger and Tommy Layne followed in the fifth, each getting an out. Chris Beck then struck out the final batter to end the inning. Beck returned to pitch the sixth and surrendered a run. Tyler Webb gave up two runs in the final two innings. Harrison Bader successfully stole third base for this fifth of the spring and fourth of the week. The Cardinals offense continued to scuffle. The team went 2-5-1 in a week where two split squad games were played against the Astros – one in Jupiter and the other at the Ballpark of the Palm Beaches. The Cardinals lost both contests, an 11-2 rout at home and a 5-0 shutout in Palm Beach. Starters for the most part have been fine, though Mikolas had a tough outing against the Braves on Tuesday. The bullpen has been hit and miss, and the offense has been weak from the starters. St. Louis’ highest scoring game was against the Nationals on Saturday. The bulk of the scoring in that game came in innings seven and nine when the starters were out of the game. Below is a summary of various reports coming out of Spring Training 2019. The status of LHP Brett Cecil for Opening Day is in doubt. Cecil appeared in a squad game on Thursday and the outing reportedly was not encouraging. The left hander is not scheduled to appear in any upcoming Grapefruit League games. Cecil has been struggling with this mechanics, and manager Mike Shildt describes Cecil as a “work in progress”. Shildt has not committed to Cecil having a spot on the opening day roster. The veteran pitcher appeared again in a squad game on Friday, but when asked about the outing, he declined comment. The bid for the fifth spot in the Cardinals rotation appears to be down to two – RHP’s John Gant and Dakota Hudson. Gant pitched a decent outing in Sunday’s 4-2 loss to the Marlins. Hudson pitched four scoreless innings against the Astros on March 8 and is scheduled to make the Monday start against the Phillies. RHP Carlos Martinez and his wife Laura are the proud parents of a third child, a daughter named Khloe, who was born on Saturday. Martinez is likely to return to camp early in the coming week. The Cardinals Number 2 prospect, third baseman Nolan Gorman, started the game at third on Saturday against the Nationals. The 18-year old 2018 first round draft pick went 1-for-4, blasting his first major league spring home run in the seventh inning. The long ball went into the walk way behind the right center field bleachers. The home run was launched off Nationals reliever Kyle Barraclough, a former Cardinal farm hand. Third baseman Matt Carpenter underwent a revised throwing program in the offseason to strengthen his throwing arm for the return to third base. Carpenter says he has changed his throwing motion and as a result is throwing pain free. CF Harrison Bader stole three bases in Thursday’s game against the Mets. According to Elias Sports, no Cardinal has stolen three bases in a spring game in the last 25 years, until Bader accomplished the feat on Thursday. 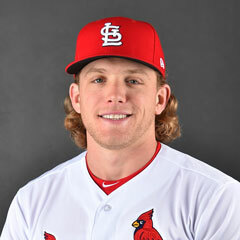 3/11 The Cardinals optioned CF Lane Thomas to the Memphis Redbirds. 3/11 The Cardinals optioned 2B Ramon Urias to the Memphis Redbirds. 3/11 The Cardinals reassigned RHP Connor Jones to minor league camp. 3/11 The Cardinals reassigned RHP Jake Woodford to minor league camp. 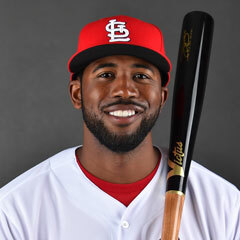 3/11 The Cardinals reassigned C Jose Godoy to minor league camp. 3/11 The Cardinals reassigned C Brian O’Keefe to minor league camp. 3/16 The Cardinals reassigned LHP Hunter Cervenka to minor league camp. 3/16 The Cardinals reassigned C Jeremy Martinez to minor league camp. 3/16 The Cardinals reassigned 2B Max Schrock to minor league camp. 3/16 The Cardinals reassigned OF Randy Arozarena to minor league camp. The Cardinals now have 45 players remaining in camp–33 roster players and 12 non-roster invitees. RHP Carlos Martinez (right shoulder) had an in injection of platelet-rich plasma a week ago. As a result of the injection, Martinez’ rehab program was extended for another week. The right hander will not throw until at least March 12. Martinez will likely not be ready to open the season on the rotation and could begin the season on the injured list. RHP Luke Gregerson (right shoulder) will likely begin the season on the injured list. Gregerson played catch off the mound on Friday, but no bullpen session is scheduled for the near future. IF/UT Jedd Gyorko is nursing a minor calf injury. Gyorko has been out of the lineup for the last week and could be out of commission for another week or so. C Francisco Pena suffered an oblique injury in the game against the Phillies on Tuesday. Pena as returned to camp and started Saturday’s game against the Nationals. OF Justin Williams continues to not appear in spring games. Williams is recovering from a broken right hand, an injury he sustained in the offseason. 3B Matt Carpenter was scratched from Sunday’s lineup with back tightness. The condition is not considered serious and Carpenter is day to day. In the final week of Grapefruit League games coming up, the Cardinals will take on Phillies in Jupiter on Monday. Dakota Hudson is scheduled to make the Monday start against Zach Eflin of the Phillies. The Cardinals have an off day on Tuesday, then play the Marlins as the home team in Jupiter on Wednesday. The Yankees come to Jupiter on Thursday, and on Friday the Cardinals travel to Port St. Lucie to play the Mets. On Saturday the Redbirds return to the Ballpark of the Palm Beaches to take on the Nationals. Finally, on Sunday the Cardinals play the Marlins again in Jupiter for the last Grapefruit League Game. Next Monday, the Cardinals travel to Memphis to play their Triple-A affiliate the Memphis Redbirds in an exhibition game. The team then travels to Milwaukee, where they will play the first game of the regular season against the Brewers on Thursday. Opening Day of the 2019 regular season begins on March 28 when the Cardinals play in Milwaukee. The first series of the season is a four game set against the Brewers, with the first game to start at 1:10 CT. That game will be followed by a 7:10 CT game on Friday, 6:10 CT on Saturday, and 1:10 CT on Sunday. The Cardinals continue on the road to Pittsburgh to play two games against the Pirates beginning on April 1. There will be no game on Tuesday, April 2. The second game of the series takes place on Wednesday, April 3. The Cardinals home opener will be on Thursday, April 4 against the San Diego Padres. Friday will be an off day, and the Cardinals will resume the series with two games against the Padres on Saturday and Sunday. In the final installment of the Hall of Fame series, we look at the man who is more famous for the major pitching award named after him than his pitching career itself. 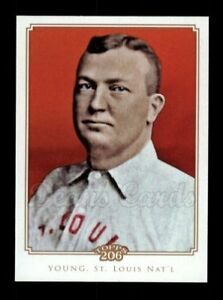 Denton True “Cy” Young was born on March 29, 1867 in Gilmore, Ohio. Young was the oldest of five children. Young was raised on a farm and was only educated up to the sixth grade. Young played for several amateur baseball leagues, including a semi-pro team in Carrollton Ohio. After the one season in Carrollton, Young joined his first professional league, a minor league team in Canton in 1889. Young’s nickname “Cy” came from destroying fences with his fastball, like a “cyclone”. Reporters later shortened the name to Cy. Young had a record of 15-15 with the Canton team. Young signed with his first major league team, the Cleveland Spiders, in 1890. He made his major league debut that August 6, pitching a three hit 8-1 victory over the Chicago Colts. It was believed Young was the hardest thrower in the game at the time. His catcher, Chief Zimmer, often put a piece of beefsteak in his glove to catch Young. Young played for the Spiders through the 1898 season. Prior to the 1899 season, the owner of the Spiders, Frank Robison, bought the St. Louis Browns. The Browns were renamed the “Perfectos”. Robison transferred most of the Spiders players to the Perfectos, including Young. The Spiders players failed to help the new team, as the team finished fifth in both 1899 and 1900. The Perfectos became the Cardinals in 1900. Young left St. Louis after the 1900 season and joined the Boston Americans of the American League. The Americans later became the Red Sox. Young played in Boston from 1901-1908. Young pitched a perfect game against the Philadelphia Athletics in 1904. Young tossed the third no-hitter of his career in 1908. At age 41, he was the oldest pitcher to record a no-hitter, a record that would stand 82 years until Nolan Ryan broke it at the age of 43. After 1908, Young was traded back to Cleveland, to the Naps of the American League. He won his 500th career game on July 19, 1910. He was traded to the Boston Rustlers in the middle of the 1911 season. His last career victory came on September 22, 1911. Young returned to farming in 1912. He was inducted into the Baseball Hall of Fame in the first year of its existence, in 1937. Young died on November 4, 1955, in Ohio at the age of 88. The Cy Young Award was created one year later in 1956. The first award was given to the late Don Newcombe of the Brooklyn Dodgers. For the first 11 years, there was only one award. It was divided into National League and American League winners in 1967.